A wide spreading shrub. The branches arch up to form a dense mounded shrub. 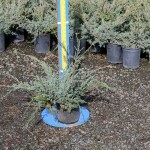 The new growth is buttery yellow, older growth is blue, for a beautiful two-toned appearance. It performs well on a variety of soils, but does best with good drainage. It needs full sun. It requires little or no pruning. Useful for mass planting, as ground cover, or foundation planting.